Dean Collins: Mastercard "LCD Display Card"
With security in mind, the Display Card has an LCD screen and touch-sensitive buttons both of which let the user employ a one-time password. Such OTPs as they’re known are often delivered via text messages or chip-based authentication devices. The card is designed for “banking institutions that necessitate a higher level of security for their online banking services require the use of a separate authentication token or device,” according to a press release from MasterCard. 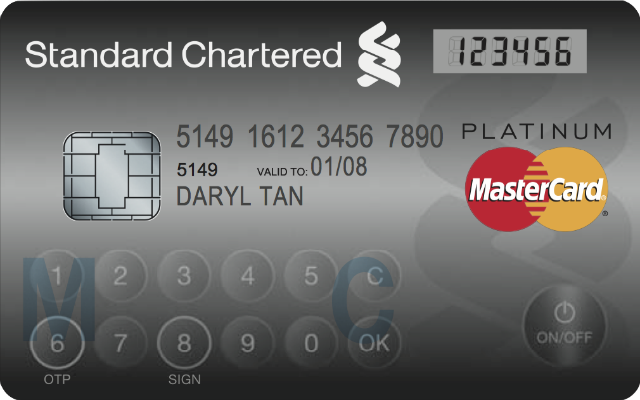 Aside from the increased functionality, the card operates like a standard credit, debit or ATM card. The idea is to provide a two-in-one device for users who have to carry a second authentication device for sensitive transactions. its a shame they didnt implement pin enter with a OTP then being displayed which can then be entered in place of the CSC to signify the user has "the real card". I'd swap banks if a USA based bank implements this functionality.